I have been waiting impatiently to finish my alphabetical blog posts so I could share this book with you. Finally, I’m able to do so! It’s an important new book from my cousin, Beverley Brenna. I hope it will be widely read and taken to heart. Opening Sentences: The week after the Bad Thing happened, Chance is back in school. Synopsis: As the review on the back cover says, “Beverley Brenna has done it again!” Actually, I think this is one of her best. It deals with a difficult subject, and some kids may find it hard to read. I strongly suggest that parents read it first, so they can help their child with questions and concerns as the child reads. As the book opens, we learn that Chance Devlin, the twelve-year-old main character, had been a part of a suicide pact with her two best friends. They went through with it, she chickened out. Now she’s dealing with grief, guilt that she didn’t stop them, guilt that she didn’t do it too, a feeling of obligation to them, continued bullying, and not feeling that she can talk to anyone about any of this. 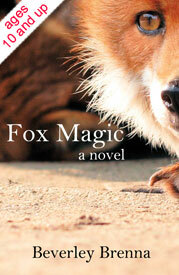 Through the help of her dad, and of a magic fox (perhaps an inner part of her? ), she is finally able to face what happened and move on. This is an excellent book with a very good interview and topics for discussion as well as numbers to call and links to help websites for kids in need of counseling and/or immediate help, at the back of the book. For Further Enrichment: There is a summary and a teacher’s guide at Bev’s website. There is an excellent (though brief) television interview with Bev available on the Fitzhenry & Whiteside publisher’s website. Information on youth suicide and links to sites in the United States can be found at the Youth.gov website and at the SPRC (Suicide Prevention Resource Center) website. The Lifeline Canada Foundation has links to crisis lines in the United States, Canada, and other places across the globe, as well as resources. Know the crisis line numbers for your own area, and keep them available. Talk with your kids. Make sure they know that they can reach out to crisis lines without being judged. Availability: Readily available. Check your local or online independent bookstore! Thank you, Melodye. Yes, it’s such an important topic these days. And Bev’s book deals with it well. Thanks also for your comment about the additional resources — I learned to do that from Susanna Leonard Hill’s Perfect Picture Book posts, and I find it very helpful, even for myself as I post. I can hardly wait to read Bev’s new book! I love the different angle on suicide and the focus on survival guilt. Am going to order her book today. Excellent review! Have wondered if she had a new book on the horizon. I am thrilled to see Beverly has written a new book. I love that she approached suicide from a different angle — the survivor. I am going to order this today. It sounds excellent. I love everything Bev writes and have wondered when her next book would be out. I have such a problem logging onto your account. I hope I finally fixed it today. Thank you so much for your comments, Pat. I really need to look into the glitches I’m having with my blog. Thanks for letting me know about the commenting one — Melodye had problems today, too, and hers showed up some time after she’d posted. I will let Bev know to look for your wonderful comments! Sounds like an important and wonderful book. Bev’s book sounds like one kids will read and take to heart. Good to see the resorces and discussion guide. Love the idea of the fox! I also like the fact that there ‘s a living family background, too. So often that is not the case in books like these. . Yes, it is definitely one that will be accessible for kids as well as extremely helpful for them. Bev approached this very sensitively and caringly — as well as with a good writer’s touch. What an amazing tool/resource for parents, teachers, and counselors. Sounds like a winner. Wow! This sounds like a powerful and, sadly, necessary book! An author who’s not afraid of writing about a tough topic. She has my admiration. It’s interesting to see a magical/imaginary element combined with reality. So effective when it’s well done. Thanks for highlighting!